We all need an understanding of the fate of the Syrian revolution: what it was up against, how and why was it drowned in blood, what its future holds. To this end, the publication of Yassin al-Haj Saleh’s book in English is very welcome. 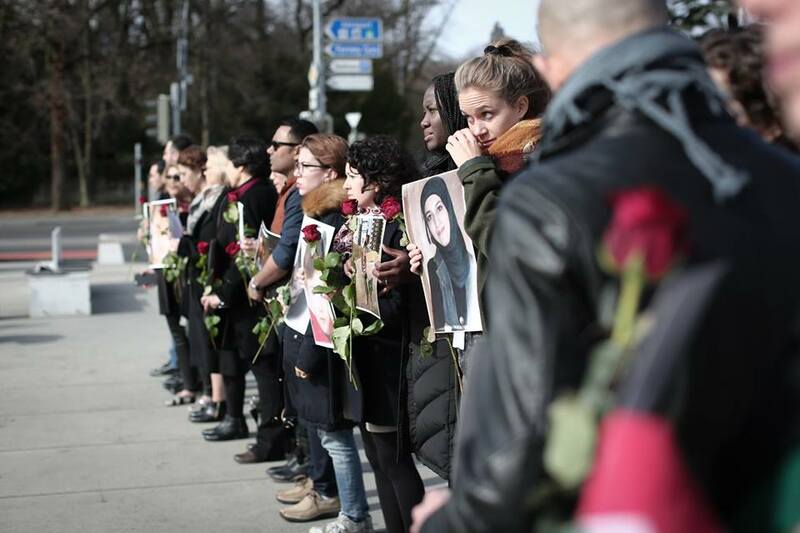 The Syrian tragedy is a turning-point for movements of social liberation internationally. A mass popular uprising of exceptional scope and scale was defeated with an exceptional horrific torrent of violence. In the rich, history of repressive governments, few have waged such savage, relentless war on their citizens, or so cynically chosen to destroy the fabric of society by civil war rather than lose control of it. Not only did the world’s governments allow the regime a free hand to torture and murder Syrians, but much of the so-called “left” stayed silent, or even supported the torturers and murderers. Reckoning with this disaster, and the reasons for it, is a precondition for any meaningful radical politics in future. 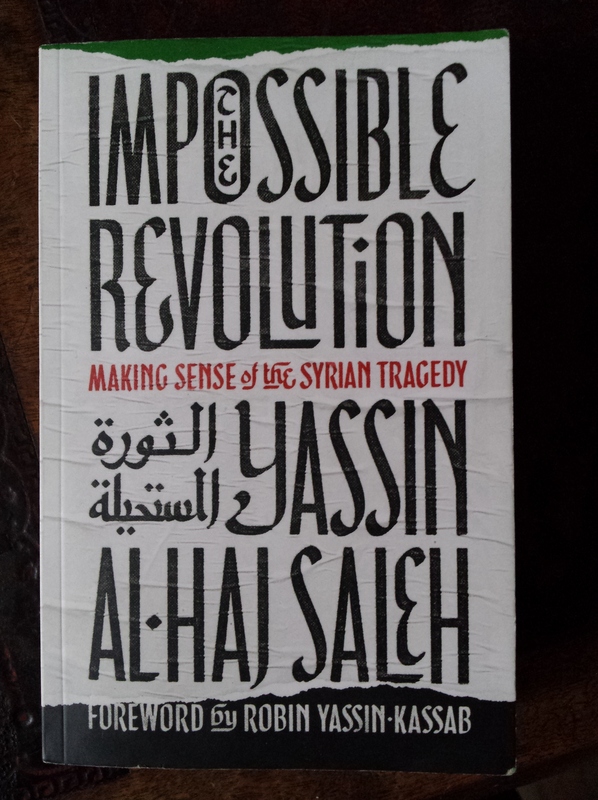 Saleh’s book comprises a series of articles written between the 2011 uprising and 2015, in which he returns again and again to analyse the Syrian regime, the “new bourgeoisie” with which it is most closely associated, and the social forces that support it. violent aggression against civilians and disregard for their lives; the use of punitive campaigns in response to any objections; and shelling towns, locales, and villages – all at the hands of a wealthy ruling clique, immune from any accountability, acting under the pretext of “defending the security of the homeland”. On examination, one may not find a systematic fascist ideology or distinct fascist social organisations, but rather a mixture of unrestrained violence and an ideology that at best overlooks violence, at worst justifies and encourages it, and which continues to oppress the people in any case (p. 92). This conception laid the foundation for a nationalistic assimilation that failed at assimilating anyone – rather, it was successful in “exiling” the Kurds in Syria from Syrian public space, though not from Syria itself. By the time the rebellion began, there were some 150,000 Kurds who had been deprived of citizenship for about half a century – the justification for which was directly dependent upon the alienating effect of absolute Arabism (p. 93). The doctrine of absolute Arabism took shape as a means to criminalise dissent and opposition; it became the basis for a personality cult around Hafez al-Assad. drew a heavy rhetorical curtain over the chronicles of sectarianism [between different ethnic and religious groups], and a thick veil of prohibition over any attempt to address the issue” – while, simultaneously, Hafez al-Assad’s repressive machine was organised. He moved handpicked relatives and friends into powerful positions in the security apparatus, which became a structure “unprecedented in Syria’s modern history” that was itself the source of sectarian tensions (p. 103). 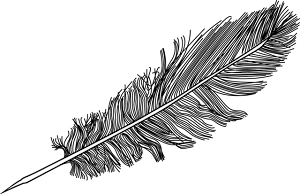 Networks of informers and spies were established; “the holy figure of the president was the centre of political allegiance and the pillar of homogeneity”; the only constants were “forced political immobilisation, the disruption of political and social movements, and the limitation of supreme power to the president and his entourage”. Saleh analyses the effect of Assadist repression on Syrian civil society: the “crisis of bonds of trust”, the “prevalence of victimhood and superiority narratives” (p. 106), and the paranoia and fear between communities. This sectarianism, he argues, then joined with organised fascist violence in the regime’s “core hellish aspect”: the unbridled torture practiced in the Tadmur Prison in Palmyra under Hafez al-Assad, where most guards were Alawites and most prisoners Islamists. The prison was closed in 2001, and reopened in 2011 as the terror against the revolution began. During the 2011 revolution, sectarianism also ran through the shabiha, the armed pro-Assad thugs responsible for some of the most atrocious crimes against the uprising, such as the massacres at Karm Al-Zaitoon in Homs on 11 March 2012 and at Houla on 25 May 2012. 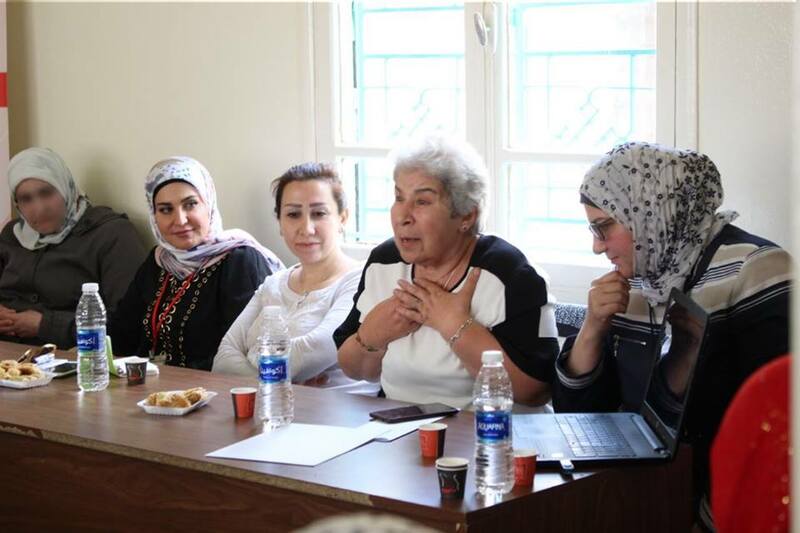 A meeting in June in Beqaa Valley, Lebanon, in support of Syrian detainees. A further basis for Syrian fascism, Saleh argues is the “new bourgeoisie” that has coalesced around Bashar al-Assad’s regime, and benefited from its adoption of neoliberal economic policies – a class “consisting primarily of ‘officials’ sons’ and their associates whose fortunes have been accumulated under the auspices of the regime, through advantageous access to contracts, deals, projects and public resources” (p. 109). Saleh examines the ideology of “development and modernisation” espoused by this class: it “enabled the new bourgeoisie to take the offensive in their struggle to gain hegemony”, he argues (p. 114). Important to this outlook was a dehumanised view of the majority of the Syrian population, seen by the new bourgeoisie as “backward, illiterate, ignorant fanatics who are responsible for their own living conditions”. When the uprising began, labels such as “retards” and “Salafists” were thrown around with abandon against those who participated. In further essays, including one on “The Rise of Militant Nihilism” (written in May 2012, on the danger of civil war and the rise of extreme Islamism) and one on “The Destiny of the Syrian Revolution” (written in September 2013, after the popular movement had suffered heavy defeats), Saleh considers the central role of extreme violence in Assad’s fascism. These arguments are vital and convincing, to my mind. In my own political formation as a European socialist, I learned to think of fascism as the resort to violent and dictatorial forms of rule by the bourgeoisie, in which the fascist takeover of the state is supported by a large and violent extra-parliamentary movement; fascism emerges in response to a strong workers’ movement that itself threatens, or challenges for, state power. The examples we grew up with were the German, Italian and Romanian fascists who grabbed power, and many other fascist movements that did not. Analytically, there were many variations on the themes. Baathism, and the regime of Hafez al-Assad it produced, does not fit exactly into categories we learned from our European experience. Like European fascisms, it gained influence over sections of Syrian society with its nationalist and exclusionary ideology – as Saleh explains, both in “The Roots of Fascism” and in the last essay in the book, “The Neo-Sultanic State”. On the other hand, Assadist fascism was not goaded into existence by workers’ movements in the way that Italian, German and Spanish fascism was in the 1930s. Crucially, to the extent that fascism is defined as the use of untramelled violence, justified by nationalist, exclusionary ideology and practiced without regard to legal norms, then the horror unleashed against the Syrian uprising was obviously fascist. Saleh’s argument helps us to see that the essence of Assadism only emerged fully in 2011-12, in direct response to a social movement that was as wide and deep as, if not wider and deeper than, European workers’ movements of the 1930s. Saleh points out that Baathist ideology drew on “communist ideology and its tactics for combating Western imperialism, illustrated in its hackneyed and essentialist hostility toward the West” (p. 98). I would like to know more about the influence of Stalinism on the Assadist combination of “anti imperialism” in relation to Israel, of its particular version of “absolute Arabism”, and of neoliberal opening to sections of international capital. My understanding, looking from afar, is that the Soviet elite was an important source of ideological sustenance, and of assumptions about statehood, as well as the more obvious forms of material and practical support provided during Hafez al-Assad’s reign. Moreover, that sits in the background of the bloody role played by Putin’s Russia in the counter-revolution of the last few years. When the 2011 revolution began, Saleh was living in Damascus. He had moved there in 2000 from Aleppo, where he had been “labouring to finish my higher education after a seventeen-year hiatus, sixteen years of which I spent in prison for belonging to a communist party that opposed the Hafez al-Assad regime”. Saleh spent most of 2011-12 in Damascus, in and out of hiding. In a striking Introduction to the book, he describes the frightful process by which the mass, peaceful, popular revolution is overtaken by, transformed into, and throttled, first by the militarisation of the conflict and then by the rise of extreme Islamism in areas freed from government control. was worried that we were heading towards a state of open warfare dominated by a logic of necessity – the necessity of fighting desperately against the offender, leaving little room for the positive aspirations of the revolution. Things like democracy and justice, knowledge and art, would become luxuries when people were being murdered, tortured and humiliated in great numbers”(p. 6). Saleh describes how, in January 2012, he sensed he was being watched, and left his Damascus hiding place, never to return. The overall situation in the country was becoming more unmanageable. It was also becoming increasingly clear that the unimaginable situation we had discussed privately – that the regime would be willing to destroy the country for the sake of staying in power – was its only political agenda, and that it was already being implemented (p. 7). The meaning of “unimaginable” here can easily be missed by readers in comparatively comfortable European surroundings. Even those who had defied the tortures and killings of the previous thirty years could not envisage beforehand the scale of violence unleashed by the regime in 2011-12. In several chapters, we see Saleh coming to terms with this onslaught. In “Arms and the Revolution”, written in April 2012, Saleh defines three phases of the revolution: (1) from March to September 2011, when the popular protests mushroomed; (2) from August 2011 to February 2012, when “the regime switched from handling the revolution primarily as a security matter to launching full-blown military operations against it”; and (3) from February 2012, a phase of “outright terrorism and a scorched-earth policy, of mass murders and the destruction of neighbourhoods and towns” (p. 77). The emergence of the revolution’s military component was certainly not anyone’s first choice, nor was it the application of a ready-made ideology of militant action. Rather, the military component emerged primary as a by-product of the regime’s militarised confrontations with the popular protests from the outset (p. 78). We have fallen like prey into the jaws of the beast – of history, that is. Our only saviours are good insight and thoughtful policies (p. 90). In “The Rise of Militant Nihilism”, written in May 2012, Saleh highlights “three ongoing processes” that he feared were creating “a propensity toward nihilism”: first, the ever-expanding violence of the regime and the shock it had induced; second, the “deeply divided and ineffective” opposition; and, third, the “regional and international paralysis” which had allowed the regime to continue slaughtering people unhindered (pp. 122-123). He describes how the feeling of helplessness and vulnerability drove participants in the revolution towards religion. In one sentence, they had announced they were God’s people, who were also helpless and targeted by an armed, aggressive force. The combination of God and arms affords ‘God’s defenceless people’ a way out of their vulnerability (p. 124). Here were the roots of “Islamic nihilism” that would from this point onwards compete with, overshadow, damage, undermine and threaten the collectivist, community-based revolutionary organisations that had taken root across Syria. This aspect of the Syrian tragedy could not be more personal than it is for Saleh. In December 2013, his wife, Samira al-Khalil, was abducted by a Salafist organisation in Douma, along with three of their friends, Razan Zaitouneh, Wael Hamada and Nazem Hamadi. All four had worked with the Violations Documentation Centre and other organisations supporting the revolution. 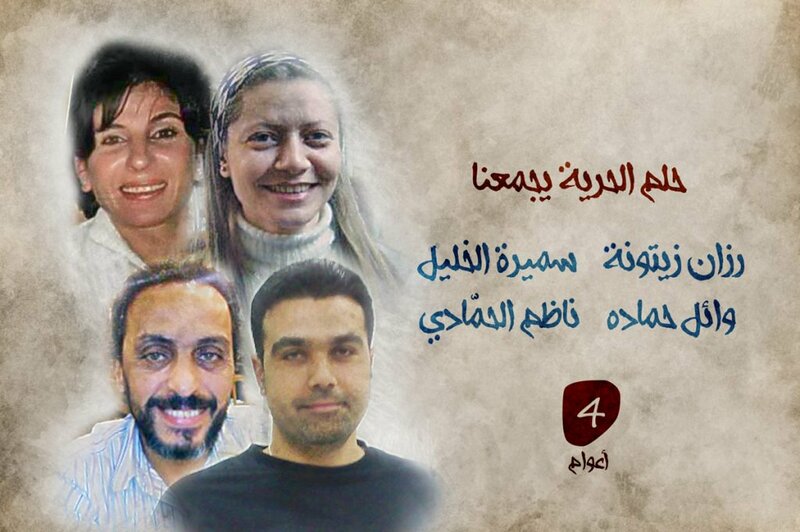 They are the “Douma Four”, around whose case Syrian revolutionaries have organised an international campaign. Saleh had left Syria in October 2013 and lived in exile in Istanbul. Samira is still missing. Saleh’s brother Firas was also abducted, by Daesh (ISIS) in July 2013, and is still missing, as are other friends and acquaintances. “These circumstances are not something from which one can be exiled; rather, they remain very present and personal” (p. 1). The defeat of the Syrian revolution, and the return of authoritarian government in Egypt, together mark a turning point in the struggle for social liberation as important as the victory of Francisco Franco and the fascists in Spain in 1936. In these two countries where the “Arab spring” was widest, deepest and brightest, it has turned to winter. The Spanish revolution of the 1930s was choked, undermined from within by the Soviet elite and the Stalinist parties internationally; eighty years on, the Syrian revolution has been physically crushed by an “anti imperialist” regime supported by sections of the so-called “left” internationally. ■ First, what does the Syrian experience tell us about social movements more widely in the twenty-first century? What was it that made possible the violence unleashed against the uprising? In many ways, the scope of that violence was unprecedented; the weaponry was many many times more deadly than that used either by the Franquistas or the Stalinist agents in the Spanish civil war. But is this just about the technology of killing? What were the political conditions that allowed Russia and Iran to support the massacre, while the other “great powers” stood by? There were precedents in the savage Russian campaign against Chechnya in the early 2000s, and the Russian intervention in Ukraine in 2014. But the destruction in Syria was on an altogether different level. I suppose part of the answer is in the changing configuration of international statehood and the decline of US hegemony. But there are vital questions that I don’t see any easy answers to. ■ Second, what do we mean by “imperialism” and “anti imperialism” today, anyway? The “anti imperialist” Assad relies heavily on the support of the Russian and Iranian regimes. The blood-soaked Russian intervention in Syria has shown not that Vladimir Putin (the butcher of Chechnya and the architect of Russian military intervention in Ukraine) has become “anti imperialist”, but that his government has been able to make a decisive imperialist-style intervention in the Middle East, notwithstanding Russia’s fundamental economic weaknesses and its integration into the world economy as an economically subordinate exporter of raw materials. The pro-Assad and pro-Putin fantasies rampant in the “left” tell us nothing about the reality of class and social struggle in the Middle East or Russia. They only tell us that, even though the “bulwark against imperialism” that was the Soviet Union collapsed more than a quarter of a century ago, reactionary statist and authoritarian ways of thinking persist. Such thinking not only subordinates popular action to state-craft and politics but in these cases effectively denies that popular action exists. ■ Third, given the historic failure of the “left” to comprehend clearly, or act effectively, on the Syrian tragedy, does it mean anything to talk about the “left” any more? I think it does not. This is not just a matter of the pro-Assad politics mentioned above. From my experience in the UK, I would say that even most “left” organisations and tendencies that did not go to the extreme of supporting (or “defending”) Assad and Putin took no steps to work together with Syrian revolutionaries. They did not regard Syrian people as actors struggling to determine their own fate. 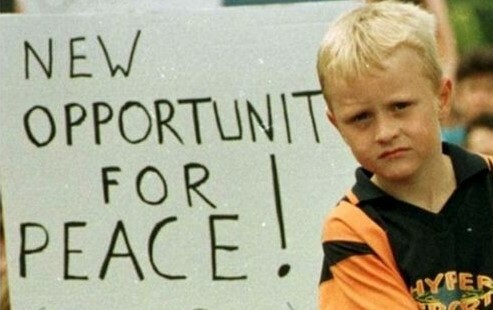 Appeals for solidarity action were considered, or ignored, on narrow political grounds. The Syrian revolution was somehow alien, something from which “we” (the “left”) had no need of, something that could offer “us” nothing. For a renewal of radical politics, understanding how the “left” has failed is necessary, but very far from sufficient. We need to understand the fate of the movements for social liberation in Syria not as we observe it from afar, but as it is lived. Perhaps some reading groups, discussing Saleh’s book, would be a start. kidnapped by the Syrian security forces near Damascus in November 2014. Her family received confirmation of her death on 31 July 2018. What revolution? A more realistic description would be that Syrian people held grievances against the Assad regime and were influenced and encouraged by Western sources to rise up and over-throw it as they wanted a regime change due to a much under-reported potential gas pipeline through Syria (hence Putin to the rescue)....the people's grievances were the fuel but the Western powers lost and so did those people...to call that a revolution is ridiculous! Great piece that should give us something to think about. Like Niall, I am not convinced about the revolutionary content of the opposition. That does not excuse the brutality and war crimes utilised to suppress it. The use of the term fascism is also food for thought. It has often been used to described less brutal regimes like Videla's and Pinochet's and was then challenged as being dubious in analytical terms. Fascistic might be more apt. As for Assad's anti-imperialism, once he became the US go to guy for torture, that supposition looked threadbare. Would love to read the book if I can ever find time.